After a good few months of prepping (and days sat editing on AfterEffects :P) our end of Uni degree show is finally underway. Happening at Hoxton Bar and Kitchen from July 1st-15th (2014), I was up there for the opening night where I’d created an animation to be shown in the showreel on the stage. The video below is a promo explaining the event, and below that photos from the set up (because I wouldn’t want to spoil all the actual work for those yet to visit). I’m going to refrain from uploading and posting my animation until the event is near a close (if you can it’s definitely worth going and having a look at everyone’s work) but I will tell you about my business cards. I realised about Saturday evening that I just hadn’t left enough time to get any sorted; business cards are one of those things that are always on your priority list but never at the top (that’s reserved for things like actually making the animation). So I decided to make my own rather than get someone else to print them; It only took most of Sunday to get them finished. The animation was called Consequences, a more ‘innocent’ take on having to deal with events that happened through the night, and these designs are based upon that animation (the idea being that the visual similarities would remind people of the work I’d produced). 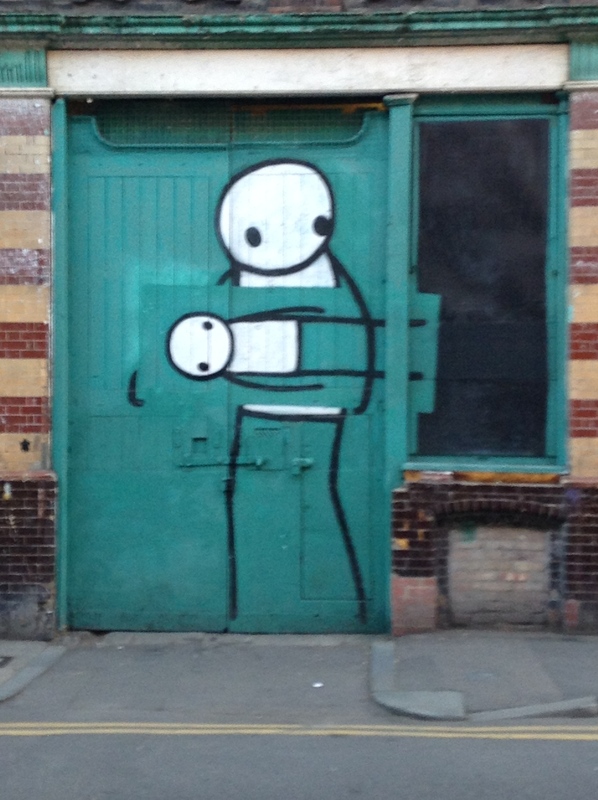 And whilst we’re here, I saw this in Hoxton and loved it; it reminds me of Don Hertzfeldt’s work. If you haven’t already, watch It’s such a Beautiful Day, it’s an amazing piece of work.